Lately Lillie has been playing this new game wherein she sums up how many "fairs" she received in the day. More often then not, she compares them to the number of "fairs" Rosie received (according to Lillie) during the day. What are "fairs" you may ask? They are a five years old's perception of justice in her world. During the recent holiday of Simchas Torah where it has become customary to distribute copious amounts of candy to children at synagogue (to symbolize the sweetness of Torah), Lillie felt she received negative amounts of "fairs". 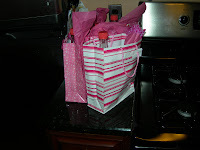 I decided to pack both Lillie and Rosie gift bags with treats they could have. I didn't even give them "healthy" snacks like raisins and apple slices. They had Laffy Taffy, Fruit Roll-ups, potato chips and punch (o.k. it was 100% fruit juice...but still). I did this to avoid any unforeseen difficult situations that may arise with the food being proffered in synagogue, as well as to make them feel they were receiving special treats just like all the other children. I thought this would work out well. It did...until someone offered Lilllie a licorice stick. I spotted the pre-teen girl out of the corner of my eye. She approached us with a wide smile, the glare from her braces reflecting off a bright red stick of licorice. "Do you want some licorice?" She innocuously asked Lillie. "No", I interjected sharply, then proceeded to mumble something about allergies, she can't have that, etc. "Oh, well how about a toffee." She countered, seeming a bit confused about the whole situation. "No, not that either, but thanks." Then she backed off. And then Lillie let loose with a tirade about the unfairness, and how Rosie had 12 "fairs" that day and she had none. And why didn't I buy gluten free licorice, etc. I felt there was no winning. And some days there isn't. I've realized that no matter how hard you plan, the emotions of a five year old are just too precarious. Sometimes your "substitutes" work out, and sometimes they just fall flat---no matter how cleverly conceived! One thing that didn't fall flat during the recent holidays was a chocolate confection I created that everyone could eat, and everyone loved! I made two dozen, and they went quickly. I also found them to be an economical alternative to store-bought boxed chocolates. They reminded me of Chunky chocolate bars a bit, hence the name. You can also use the melted chocolate from this recipe to make chocolate dipped frozen bananas. For a cute story, and easy recipe, check out the charming storybook No More Cookies by Paeony Lewis. Place margarine and chocolate chips in a microwave safe bowl. Microwave on high for 2 minutes. Stir until smooth. If chips aren't completely melted, microwave in 15 second increments, stirring in between, until fully melted. Stir remaining ingredients into melted chocolate until well blended. Drop by tablespoonfuls onto a waxed paper covered baking sheet or tray, or into mini paper baking cups. Refrigerate until firm, about 30 minutes. Store covered in the refrigerator up to 2 weeks.